all who are thirsty: One wet day - plus evil Kanievel (sp?) lessons! One wet day - plus evil Kanievel (sp?) lessons! Hello to all of my american friends back home! The past couple of days have been really adventurous, especially tuesday! On Tuesday, Michael and I needed to do some diagnostics on the current Nyahuka water system. We are fearing that there might be a problem with the pipeline that is reducing the downstream flow. In order to do this we needed to measure to flow rate of water at the resevoir tanks (that was the easy part) which are downstream and measure the flow rate of water at some point upstream (not so easy). In Uganda, the technological capital of the world, you measure the flow rate by seeing how fast the flow can fill up a 20 Liter bucket. You divide that by the number of seconds to give you the flow rate in L/s. Now I know that sound incredibly exciting to you all...however, when you are trying to get the upstream flow rate and in order to do this you have to disconnect the main line into town, WHILE IT IS STILL ON! It can get very exciting. We ended up measuring 4 L/s upstream...think 4 nalgenes full of water flying at you out of the pipe every second!! It's a lot of water (ok, so that may not be a lot of water for a pipeline say if your pipeline is run by an excellent publically owned utility that serves a large metropolitan area...but it's pretty big for Africa :-). Needless to say, we got pretty wet. Unfortunately we didn't have a camera man there to film the "during" process (ahem...Tim), but i did get a good before and after with the video camera. 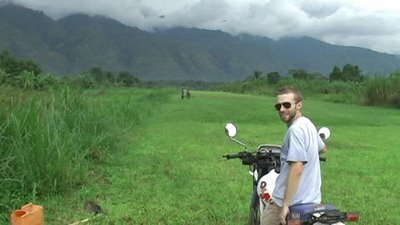 The other exciting thing about tuesday was that Michael gave me motorcyle lessons at the airstrip (yeah it's really convenient having a grass airstip 10 minutes away, you wouldn't think of all the ways you use it). It was awesome!!! It requires a special set of coordination that you have to develop to shift through the gears, but having driven a manual car before at least the idea was there. After about 15 minutes or so I was ready for some jumps! Ok, so really after 15 minutes, I was able to drive with out stalling it out, but it felt like I was ready for some jumps.